Gettysburg College New Housing Initiative: “Too Cold for Mold” | The Gettysburgian. As the snow continues to fall with no signs of slowing up, more and more igloos appear to be popping up around campus. Gettysburg College students have simply had enough of the mold and various other residential issues, so they decided to take measures into their own hands. 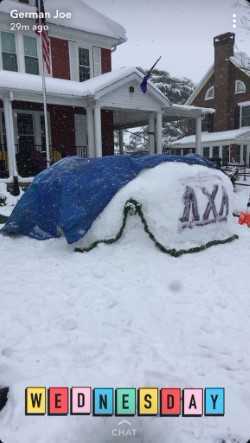 So far, these new igloo habitats have been spotted at SAE, Lambda, and 35 East Lincoln. While most of the student body approves of this creative and innovative solution, some faculty and staff are expressing their concerns. While both sides of the argument are very convincing, it is difficult to disagree with the student. Another student proposed a third idea, which would entail, “knocking down every building on campus and replacing them with giant igloos.” We at GettyLeeks found this statement very difficult to disagree with as well. Sources at Residential & First-Year Programs have confirmed that this is in fact the beta-testing model of what appears to be the solution to mold-infested dorm rooms. If the beta program proves successful, students will see an increase in room and board fees, due to the continuous access to air conditioning. Now you, faithful reader, may be wondering: What happens when the igloos melt? We were wondering the same thing. Associate Director of RFYP, Allison Schofield refused to comment on this evident issue. Could we be living in a real life Club Penguin in the near future? We will just have to wait and see.